What will they do when their “harmless” curses suddenly start coming true? Grace and her four best friends, Jenny, Rachel, Adie, and Una, are failed spell casters-and they have a notebook full of useless spells to prove it. But one night, when they use a Ouija board for the first time, they stumble upon real magical powers-and their notebook takes on a diabolical life of its own. The girls watch, helpless, as one by one, their spells start to work, moving relentlessly toward the worst one of all…Can Grace and her friends stem the wave of powerful magic before disaster strikes? Usually I like it when books launch right into the action, but in this case it made for a very confusing beginning. First of all, there are five girls who are best friends in this book. This seems a lot of main characters for a middle grade novel, but the most frustrating thing about it is that no one girl emerges as the leader, and as a matter of fact they all just blended together for me. No individual girl shows any personality, and we don’t even get descriptions or even their likes or dislikes–I would have taken anything to give each girl a little tidbit to differentiate them. The second thing is that the girls are doing magic and talking about spells and past things they have tried right on the first page. We don’t even know if they’re real witches, or just girls goofing around, or anything really about the magic or why they’re trying to cast spells. This information doesn’t even come up until about 3 chapters in. I was somewhat lost until then. This book is a classic case of what can happen when you actually get what you wish for, and I think for younger readers this is a lesson they need to learn. Younger girls who may think witches are fun might enjoy this book, but it wasn’t for me as an older MG reader. Erika McGann grew up in Drogheda and now lives in Dublin. She has written two books, The Demon Notebook and its sequel The Broken Spell, and is currently working on the third book in the series, The Watching Wood, which will be published in Ireland and the UK in September. 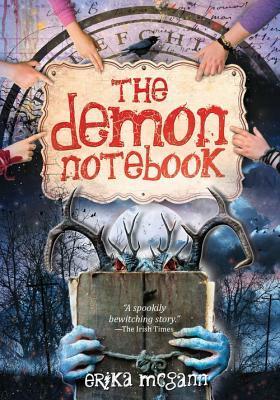 Erika was recently announced as the winner of this year’s Waverton Good Read Children’s Award for The Demon Notebook. Posted on May 27, 2014, in books, reading, review. Bookmark the permalink. Leave a comment.